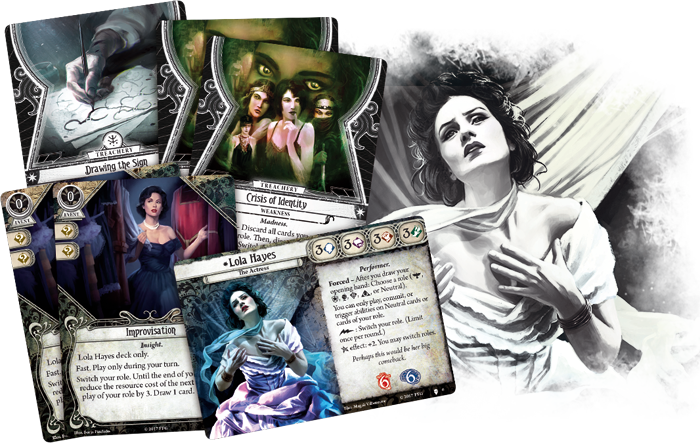 A new theater production is coming to Arkham all the way from Paris. Unsurprisingly, it's been all the rage in conversations among Arkham's socialites. But in your efforts to learn more about the play, you've uncovered a darker history. Disappearances. Suicides. Delusions. Insanity. Wherever The King in Yellow is performed, madness follows close behind. The King in Yellow—and all the strange events surrounding the play—take center stage in the two new scenarios from The Path to Carcosa. Curtain Call is your ticket to Ward Theatre, where you can catch the much-awaited performance. And in The Last King, you join the play's cast and crew at a dinner party, in the hopes that some of them might provide you answers to the many questions burning in your mind. 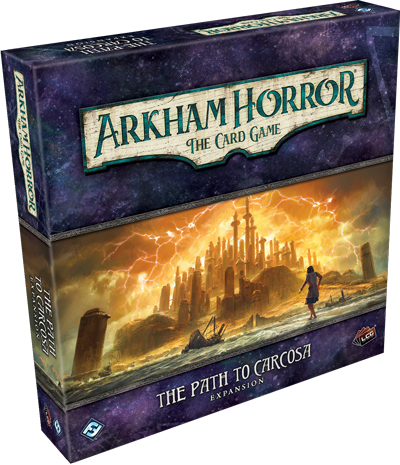 Both of these scenarios can be played on their own as standalone adventures, but together they represent your first steps along The Path to Carcosa campaign, which you can pursue more fully through a cycle of six Mythos Packs. Over the course of your campaign, you'll learn more and more about the larger threat the play may pose—and encounter many of the terrifying new treacheries and enemies from the expansion's eleven encounter sets. And you'll find yourself keeping secrets from the other investigators. 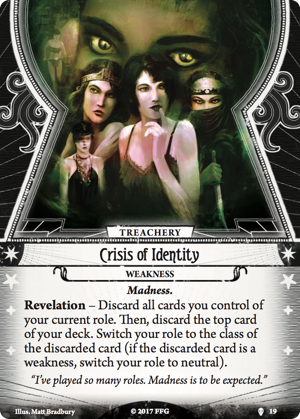 As befits its unique exploration of the realms between and beyond sanity and madness, The Path to Carcosa introduces a number of encounter cards that feature the new keyword, "hidden." Whenever you draw a card with this keyword, you keep it hidden from your fellow investigators and place it in your hand. But even from there, its abilities exert their insidious influence over the course of your game. Additionally, The Path to Carcosa campaign introduces mechanics for Doubt and Conviction, both of which you'll mark in your campaign log, depending on the choices you make. These decisions may then come back to haunt you in later scenarios. And, finally, The Path to Carcosa also marks the debut of a new card type, story cards, which serve as avenues for additional narrative… and other effects. There's plenty of madness and mayhem in the expansion's scenarios—more than enough, in fact, to drive your investigators stark, raving mad. But if your Core Set investigators should falter, you needn't yet abandon all hope. 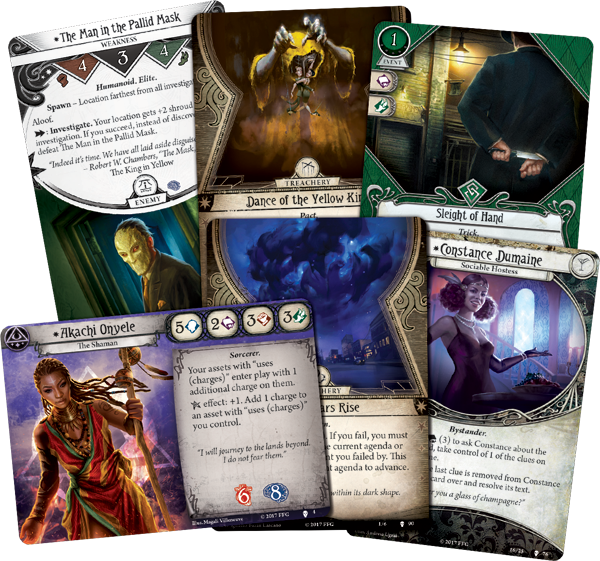 The Path to Carcosa introduces six new investigators, all of whom come complete with their signature advantages and weaknesses, plus a wealth of forty non-signature, non-weakness, new player cards (two copies each of twenty different cards). 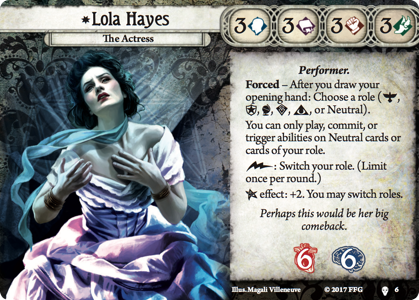 All of these are divided between the game's five classes—Guardian, Mystic, Rogue, Seeker, and Survivor—except for one of the new investigators, the actress Lola Hayes (The Path to Carcosa, 6). 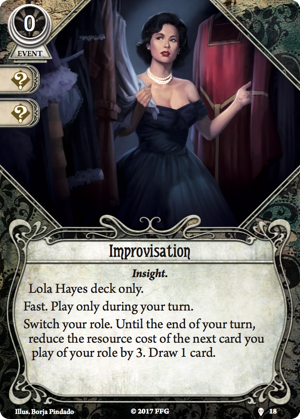 The game's first Neutral investigator, Lola Hayes arrives with remarkably balanced attributes, and deckbuilding requirements that allow her to select thirty-five of her favorite level 0–3 cards from all the different classes. To her, each class is just another "role," and she can shift her role as she wishes, doing so once per round as a free ability. But nothing in Arkham is ever simple as it may seem. Is Lola Hayes the actress, an expert of Improvisation (The Path to Carcosa, 18) who slips in and out of roles as she chooses? Or is "Lola Hayes" just another role, one among many? Are there other forces directing her life, steering her down paths she'd rather not travel? Amid the chaos and terror, such fears may lead Lola toward a Crisis of Identity (The Path to Carcosa, 19). 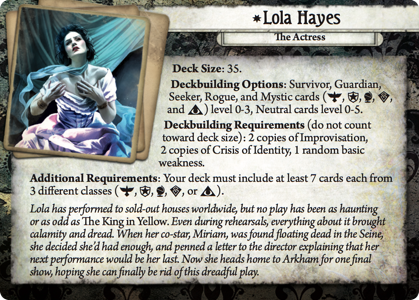 Still, Lola Hayes isn't the only investigator from The Path to Carcosa to push the game's deckbuilding options in all-new directions. Each of the new investigators offers something different. New deck sizes, new ways to combine cards from multiple classes, or multiple copies of their signature strengths and weaknesses.